The Samsung Galaxy S9 is the best Android phone out there, but it’s not faster than the iPhone X when it comes to benchmarks and intensive tasks. That’s right, the A11 Bionic chip is still miles ahead of the competition in 2018. But the competition has gotten so good over the years that the Galaxy S9 Plus can actually outperform the iPhone X in some real-life usage tests. The first lap shows you how fast each phone loads applications, while the second lap focuses on how fast an app is reloaded from memory. In other words, the test tries to replicate real life smartphone usage, where you’d be switching between various apps during the day, including web apps that load almost immediately, as well as more resource intensive apps like games. The iPhone X wins the first lap only because it can process 4K videos faster than the Galaxy S9+. But Samsung’s phone, powered by Qualcomm’s Snapdragon 845, does exceptionally well. What really helps the Samsung phone is the significant bump in memory. The Galaxy S9+ has 6GB of RAM compared to the iPhone’s 3GB — the Galaxy S9 only has 4GB of RAM. That extra RAM lets the Samsung phone breeze through opening apps from memory, and it’s something we saw happen with the Galaxy Note 8 last year and other phones that pack more RAM than Apple’s iPhones. Also of note, iOS 11 has had memory management issues since it was first released. 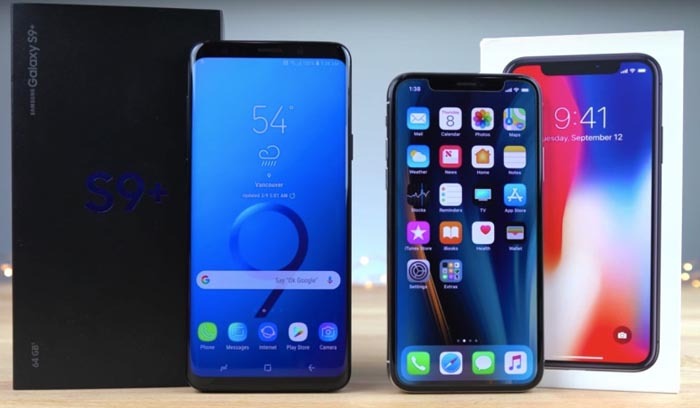 We’ve praised Apple’s iPhone performance in the past, as older iPhones would consistently outperform brand new Snapdragon and Exynos-powered Galaxy phones in similar tests. This time around, the Galaxy S9 is the clear winner, and I wonder how the Exynos 9810 version does. It sure looks like Apple has some fixing to do if the most powerful mobile chip out there can’t really prove it’s the best in these tests.